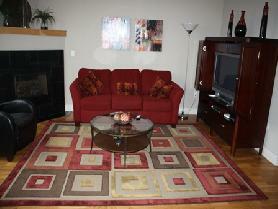 1 Bedroom/1.5 Bathroom East Denver Condo with a 1 car attached garage. This amazing property features an enclosed office; custom designed built-in entertainment center complete with a large flat screen TV; a full washer and dryer inside the unit; contemporary lighting and built-in climate control; granite counter tops, stainless steel GE appliances, and upgraded cabinetry in the fully loaded kitchen; pillow top mattress; a full size oval soaking tub in the master bathroom and upgraded laminate counter tops; and private entry with a steel front door. 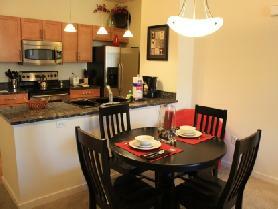 The community features include a pool, fitness center, and secured access. To view more photos, maps, and information about this gorgeous upgraded condo, please click here. Denver Technical Center 1 Bedroom/1 Bathroom Condo with a 1 car attached garage. This property’s features include a fireplace; granite counter tops; stainless steel appliances, a full sized washer and dryer in the unit; a private balcony; a king sized bed with a pillow top mattress; vaulted ceilings; and an upgraded bathroom with full size tub. The community has a pool, fitness center, and club house. To view more photos, maps, and information about this amazing property, please click here. 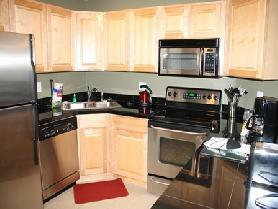 2 Bedroom/2 Bathroom Denver Technical Center Contemporary Loft with a 1 car attached garage. Come stay in this beautiful, newly constructed loft with a contemporary luxury design! This chic unit includes: hardwood floors throughout; large flat screen TV in the living room; fireplace; plenty of closet space; a king sized bed in the master bedroom and flat screen TV; fully equipped kitchen with granite counter tops and lovely cabinetry; a private balcony with a patio; and a full sized washer and dryer in the unit. This is a corner unit so there is no street noise and it is conveniently located to restaurants and bars. To view more photos, maps, and information about this inspirational loft, please click here. To view all of the amazing properties that AvenueWest Denver has to offer, please visit us at http://Denver.AvenueWest.com or give us a call directly at 303-825-0000.